Wisteria (Wisteria spp.) and grapes (Vitis spp.) are two large deciduous vines with remarkably similar growth habits. Both grow in U.S. Department of Agriculture plant hardiness zones 5 through 9 and lend a warm, rustic feeling to the landscape when grown over an arbor or fence. Sometimes, because of landscape renovations or for other reasons, it may be necessary to transplant large, older grape and wisteria vines. The task does require some heavy labor, but it can be accomplished with surprisingly little harm to the vines if done during the winter dormant season. Cut down the grape and wisteria vine, leaving only 3 or 4 feet of the main trunk. Make the final cut in the main trunk of the vine at a 45-degree angle. Dig a trench with a spade shovel in a 2-foot radius around the base of the trunk. Remove all the soil around each root that passes through the trench to avoid dulling your cutting tool, then cut each root. Grapes and wisteria are shallow-rooted, so the trench needs to be only about 6 to 8 inches deep. Loosen the remaining soil between the trench and the trunk of the vine. Remove all the soil from the trunk, being careful not to damage the larger roots. Dig into the soil under the main lateral roots once they have been exposed to free any roots that may be growing downward. The goal is to transplant a root mass approximately 4 feet in diameter and 1 foot deep. Any roots that anchor the vine in the soil below 1 foot can be cut to free the vine. Spread a tarp or sheet or burlap under the excavated roots and use it to move the vine to the location where it is to be replanted. Depending on the size of the vine, this may require up to four people -- one to lift each corner of the tarp. The vines should be transplanted immediately. Dig a hole just big enough to fit all the roots. Bury the root mass so the topmost roots are just an inch or so below the soil surface. Incorporate 10 or 12 shovels of compost into the planting hole as the soil is being replaced. Push soil into all the little nooks in the root mass so there is no air remaining around any of the roots. Tamp the soil firmly and water thoroughly. Apply 3 or 4 inches of mulch over the root zone to keep the the roots cool and conserve moisture during the coming growing season. It will be two or three years before wisteria and grapes begin to flower and fruit again after being transplanted in this way. Grapes and wisteria should be transplanted when dormant, but late in winter when temperatures have stabilized above freezing and well before the buds begin to swell. Tender new root growth begins several weeks before the leaves emerge and can be damaged if transplanting is done during this period. Cutting off the entire top portion of the vines may seem harsh, but it is the only way that large, older vines can successfully be transplanted. In the winter, all the vine's energy is stored in the roots, helping the plant to push out new growth in spring after it is transplanted. If the vines are left on the plant, the root system will not have enough energy to support them after transplanting and there will be significant dieback, exhausting the root system in the process, and possibly causing the plant to die. If the soil is dry, water the area around the vines the day before transplanting to facilitate the process of removing the roots. Wait to fertilize the vines until summer. Heavy doses of nitrogen can do more harm than good during the initial stage of transplant shock. Sterilize all pruning equipment before using and between working on each plant. This helps prevent the spread of disease. Dip the cutting blades in rubbing alcohol or a 10 per cent solution of bleach and leave for several minutes. 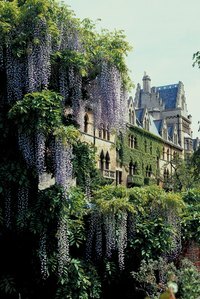 Wisteria is a highly invasive species in some regions. In these areas, it may be better to eradicate the plants rather than transplant them.